The Toronto Maple Leafs need help on the right side of their defense. The Carolina Hurricanes have a surplus of right-handed defenders. That match has been obvious for so long that trade speculation has run through basically every single potential move, and yet no move has actually been completed. Still, the speculation will continue today after Darren Dreger of TSN reported that the Maple Leafs had management members at the Carolina-Calgary game last night scouting the available defensemen—though he makes no mention of who those defensemen may be. For that you have to look at the recent reporting from other sources, ones like Pierre LeBrun of The Athletic who recently wrote that the Hurricanes are willing to move a top-four defenseman before the deadline. Any of Dougie Hamilton, Brett Pesce or Justin Faulk could be considered top-four options (despite the obvious nature that not all three right-handed defensemen can technically be in the top-four), and any would fill a need for the Maple Leafs who have been searching for another quality option on the right side for some time. It’s no surprise that the team is watching Carolina closely, but there still isn’t any reporting that a deal is imminent between the two clubs. There’s plenty of reasons why that may be the case. For one, the Maple Leafs don’t necessarily have a top-six forward to hand over given their recent struggles. William Nylander hasn’t yet been able to find his form since signing a big contract, and the team has now decided to put Auston Matthews and Mitch Marner together in order to try and spark something on offense. Add in that rookie Andreas Johnsson is dealing with a concussion and Patrick Marleau has taken a clear step backwards and the Maple Leafs might not be so quick to be trading away from their forward group at this point. A top-six forward is what the Hurricanes have been looking for according to all reports, and not just a prospect that may contribute that kind of production in the future. The Hurricanes are now sitting just six points out of a wild card spot in the Eastern Conference and have made it clear that they want to win sooner rather than later with new owner Tom Dundon at the helm. Given that they’re probably going to have to trade away Micheal Ferland—currently second on the team in goals—if they can’t come to an extension in the next few weeks, adding future assets for their defensemen doesn’t really make sense if their target is the 2019 playoffs. Teams break for the All-Star weekend after tonight’s games, and both Carolina and Toronto will also experience their CBA-mandated “bye week” after the festivities are over. That gives both clubs ample time to asses their rosters and determine what exactly they need to do moving forward. You can bet that as the calendar turns to February there will be more contact between the two teams, and more speculation from everyone else. It’s been months if not years of speculation surrounding the Carolina Hurricanes and their depth on defense, but now as the team has started playing well and is pushing closer to the final playoff spot in the Eastern Conference things are heating up. 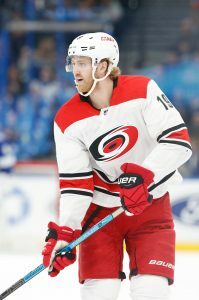 Today, Pierre LeBrun of The Athletic reported (subscription required) that the Hurricanes are willing to move one of their top-four defensemen, and noted that both Dougie Hamilton and Brett Pesce are generating interest from around the league. Carolina is interested in landing another top-six forward, especially given that pending free agent Micheal Ferland is “all but gone” according to LeBrun. Since the Hurricanes have already indicated that Jaccob Slavin is the one untouchable on the blue line, trading a top-four option would likely come down to Hamilton, Pesce or former co-captain Justin Faulk. Calvin de Haan does have some claim to a top-four role of his own, but between just signing with the Hurricanes in the summer and not being part of the overload on the right side, his availability seems more unlikely. It won’t surprise anyone to find out that the Hurricanes are listening on a trade of this magnitude. This is the team that has jettisoned Elias Lindholm, Victor Rask, Noah Hanifin and Jeff Skinner in the last six months as they try to find a new identity under owner Tom Dundon and head coach Rod Brind’Amour. Dundon has made it clear that he wants to win and he wants to win now, something that they’re going to need more scoring to accomplish. Hamilton and Pesce both represent huge targets for other teams around the league, but they come with much different financial situations. Hamilton, 25, is signed for just two years after this season and comes with a $5.75MM cap hit. After starting the season strong he has seen his minutes reduced of late, playing fewer than 20 minutes in 16 of his last 20 appearances. Pesce’s ice time meanwhile is headed in the opposite direction, logging four of his top-five totals in this month alone including nearly 23 minutes in a win over the Edmonton Oilers on Sunday. The 24-year old also comes with five additional seasons under contract at a reasonable $4.025MM cap hit. The two come with very different on-ice profiles too however, as Hamilton is a possession-driving offensive option while Pesce is of the more reliable stay-at-home variety. In fact, Hamilton has recorded almost three times as many shots on net this season given his ample powerplay time, while Pesce easily leads the Hurricanes in short-handed time per game. That kind of stylistic gap will make it very interesting to see who the Hurricanes deal, as moving either one would open up an opportunity for someone else to step in. It also would offer some insight into what the acquiring team is after, especially as the playoffs draw closer. Obviously it’s not even a certainty that one of the Hurricanes defensemen is moved at all, but as the trade deadline comes within view they will be one of the teams most watched for any activity.